The abundance of holiday shopping data pouring in so far shows that mobile is playing a bigger role in e-commerce than last year. The share of traffic to retail sites on Black Friday rose to 24% from 14.3%, and the mobile share of sales hit 16%, up from 9.8% a year ago. 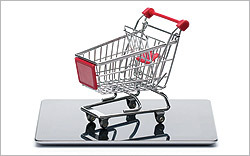 Increased adoption of smartphones and tablets in the last year has been an influential factor in the m-commerce gains. Nielsen in September reported 55.5% of U.S. mobile subscribers had smartphones as of July, up from 41% a year earlier. Data from the Pew Research Center in October showed that tablet penetration had doubled to 22% from a year ago. New findings released by Pew on Sunday show a growing share of mobile users are doing more activities on their phones. More than half (56%) use their phones to access the Web, up from 25% in 2008. The share of people downloading apps has doubled to 43% since 2009. The data all points to a larger addressable market for mobile sales and promotions during the holiday season. Another contributing factor may be efforts by marketers to capitalize on that opportunity by expanding or upgrading their mobile presence. Data highlighted by Web marketing firm HubSpot, for example, shows that eight in 10 marketers are investing in a mobile or tablet app this year, up from 49% in 2011. Similarly, 84% are using mobile-optimized sites -- up from 57% in 2011 -- and 80% are turning to mobile advertising, up from 50% a year ago. Three in 10 were set to promote an in-store Black Friday deal with mobile alerts, compared to 18% in 2011. Three-quarters of companies also planned to increase spending on mobile-centric social tool Twitter. Still, the research collected by HubSpot from sources including Experian and Shop.org suggests that marketers have more work to do when it comes to being mobile-ready for the holiday season. One in three e-commerce brand emails, for instance, link to a non-mobile-optimized landing page.